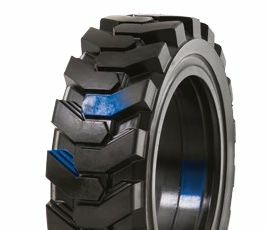 A solid skid steer tyre solution for flat-free, off-road operation. Designed with durability in mind, it also provides excellent clean out for improved off-road traction. CAMSO SKS 782S (formally SOLIDEAL SafetMmaster SKS) is a premium skidsteer tyre option for the use in the harshest of applications. The CAMSO SKS 782S utilises a deep “Hauler step” tread design for better ground contact and mud clearing capabilities. Wide sidewall profiling to offer maximum durability and wheel protection. The CAMSO SKS 782S is designed to wear to maximum levels whilst maintaining good structure. REUSABLE HEAVY DUTY WHEEL – only pay for replacement tyres and reduce waste.